Ceramic Morphologies explores the design opportunities of a novel ceramic 3d printing strategy. The project was developed by researchers and students from the Material Processes and Systems (MaP+S) Group at the Harvard University Graduate School of Design. 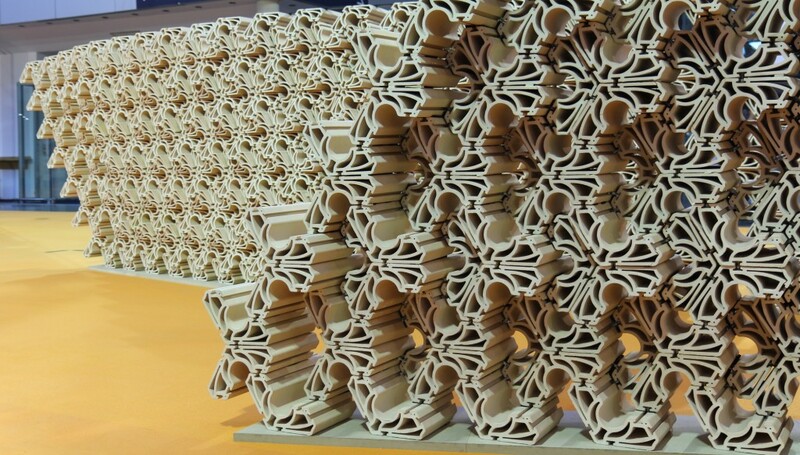 Supplemented with production and material research by the Instituto de Tecnología Cerámica in Castellón, Spain, the project is a prototype for the additive manufacturing of ceramic building components at the industrial scale. The pavilion is meant to showcase the expressive potential of ceramic 3d printing, and test the adaptation of principles of thermodynamic heat transfer to 3d printed geometry. The shape and design are products of current research related to the thermal performance of naturally ventilated spaces – the result of our collaboration with our colleagues Salman Craig and Matan Mayer from the Harvard Center for Green Buildings and Cities. While the exterior surface of the pavilion is smooth and uniform, the interior surface is heavily contoured and 3d textured. In addition to creating a unique relationship between interior and exterior space, the geometry of this undulating surface relates to research on the optimal dimensions for thermodynamic heat transfer. The thermal agenda is embedded in the logic of both the pavilion’s interior surface geometry and the configuration of its overall form. Its pyramidal shape facilitates upward air movement, and the interior geometry impacts the thermal exchange between ambient air and the interior mass/surface. The contoured, sinusoidal texture of the interior surface is designed to optimize the ratio of surface area to thermal mass, and maximize the potential for cooling through natural ventilation and buoyancy effects. The project team has created mathematical models to predict the thermal behavior of the system. The project utilizes a proprietary clay extrusion system and 3-axis armature to produce each of the pavilion’s 552 unique ceramic elements. Each element is sized according to its position within the structure, the dimensional constraints of the printing bed, and a maximum allowable toolpath length. The team developed a novel computational approach to generate the surface geometry of the pavilion, discretize the form into individual bricks, and accommodate for the structural metal frame. Toolpath geometry and machine code is also generated directly within the parametric model. The digital workflow enabled the research team to account for shrinkage during the drying and firing process, reduce overall printing time and material consumption, and tune the stability of individual bricks. Measuring 3 m tall, with a footprint of 3.2m x 3.6m, the pavilion consists of 552 unique elements ranging from 260-545 mm in length, and 70-150 mm in height. 184 elements, representing 1/3 of the entire structure, are displayed in the current configuration shown at the 2017 Cevisama Fair in Valencia, Spain. Gaps between pieces allow for tolerances in the production. The modules can be bonded with mortar for permanent installations or, for temporary applications such as Cevisama 2017, can be dry-stacked and secured to a support frame. In total, the 184 printed elements displayed required 358 hours of printing time, and include 19.84km (12.33 miles) of extruded clay bead. Project Team: Professor Martin Bechthold, Director; Salmaan Craig, Lecturer in Environmental Technology; Nono Martínez Alonso; Jose Luis Garcia Del Castillo; Tiffany Cheng; Kevin Hinz; Namju Lee, Zhiwei Liao; Matan Mayer; Saurabh Mhatre; Zach Seibold; Santiago Serna González; Juan Pablo Ugarte.